Capsular tension rings are used to stabilize weakened, broken, or missing zonules during cataract extraction using phacoemulsification and continuous curvilinear capsulorhexis techniques. 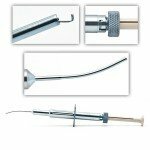 Injectors are used to implant the Morcher capusular tension ring. 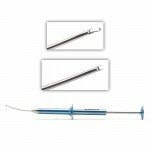 Syringe-style micro inserters provide a high level of control during the procedure. Inserters consist of a wire with a hook tip, which is used to grasp the capsular tension ring, attached to a plunger and cylinder. After the capsular tension ring is loaded into the cylinder tip, it is inserted into the lens capsule. Bayonet fitting allows for easy separation of the center rod and main body. Overall length of 145 centimeters.